Samba Fogo proudly presents Fogo Vivo – Living Flame, an evening of live music and dance, on fire! 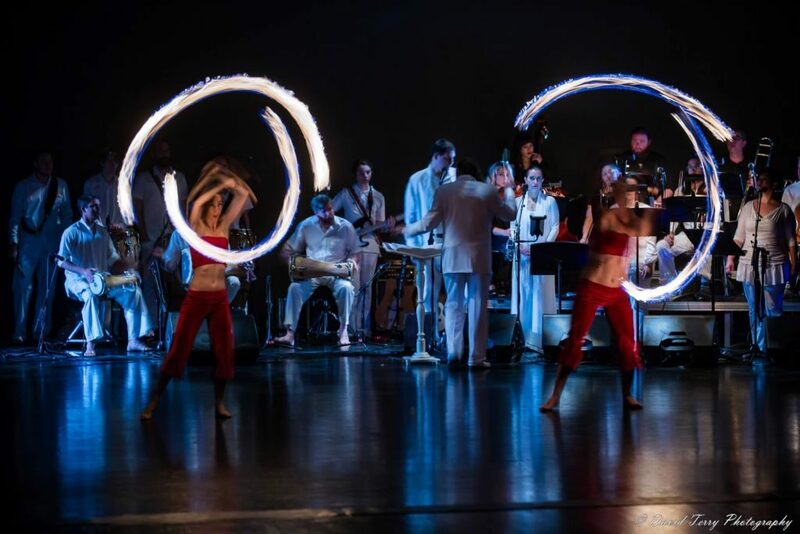 Drawing on rich Brazilian culture and mythology, Samba Fogo ignites the stage as they weave traditional and contemporary dance forms, fire spinning, and diverse live music. The live band for this year’s concert includes vocalists Solange Gomes and George Edgar Brown, backed by horn players, a string quintet, and the largest drum line Samba Fogo has ever featured on stage – a diverse and dynamic orchestra, providing a rhythmic and musical backdrop inspired by traditions from Cuba, Africa, and Brazil. Fogo Vivo will feature several very special guests, including world-renowned dance artist Rosangela Silvestre. Between performances in Montreal, Geneva, Zurich, Paris, and Tokyo, Rosangela will be stopping in Salt Lake City to perform a few pieces in Samba Fogo’s concert. A truly masterful dancer, Rosangela has a powerful stage presence and stellar dance technique. Fogo Vivo will also feature master percussionist Jorge Alabe from Rio De Janeiro. Mr. Alabe was one of the first drummers to bring Brazilian percussion and samba drumming to the United States, traveling the globe with the world-famous Samba group, “Oba Oba.” Jorge is a father of Brazilian percussion in the US and is an extremely powerful drummer and performer. Samba Fogo is a local 501(c)(3) non-profit cultural arts organization inspired many years ago by the excitement and beauty of Afro-Brazilian music and dance. For over a decade Samba Fogo has been enriching the community and inspiring others through live performance and arts education along the Wasatch Front and throughout the Western United States. Tickets to Fogo Vivo – Living Flame are $20 for students and $28 for general public. Tickets are available online at ArtSaltLake.org, at all ArtTix locations, or by calling 801-355-ARTS. This event is recommended for ages 8+. No babes in arms. Content is suitable for all ages. This presentation of Fogo Vivo- Living Flame is supported by the ZAP (Zoo, Arts & Parks) Program, the Utah Division of Arts & Museums, the George S. and Dolores Doré Eccles Foundation, the Rocky Mountain Power Foundation, and the Salt Lake Arts Council. The performances will begin at 7:30 p.m. in the Jeanne Wagner Theatre in the Rose Wagner Performing Arts Center on April 25, 26 & 27.